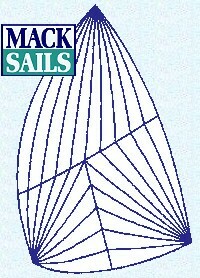 Nance & Underwood Rigging and Sails proudly represents MACK SAILS in southeast Florida. Mack Sails are well known for their quality sails of all types including MiterCut Dacron Genoas, Full Batten Mainsails, Asymmetrical Cruising Spinnakers, Tri-Radial, Radials as well as tried and true cruising designs. See more below. Forty years ago virtually every genoa made for performance sailing was miter cut, like the drawing at the left---whether constructed of cotton, nylon or the then new Dacron. The miter in these sails was not simply a benign seam to hold the two halves of the sail together, but rather, a very sophisticatedly crafted avenue into the heart of the sail, that when done right, could anticipate the natural stretching and locking of the fibers in the cloth, guaranteeing that the draft would stay forward and the after area of the sail would stay lat and clean. Sailmaker's reputations were built on the execution of their miters---perhaps none more so than Hood sails of the 1960's. (Many hard-used Hood genoas can be found today that look and perform better than their two or three year old counterparts from "modern lofts"). But, by the 70's mitered genoas were being pushed into obscurity by the pressure of modern economics (the miter is labor intensive) and production requirements (it takes trained sailmakers---not kids hired off the street). Sailmakers were also eager to produce sails that were "fast out of the bag" . In reality, such sails were a little less fast each and every time used. The fact remains that material does stretch, no matter whether it's new modern Kevlar, Spectra, Technora, Mylar and certainly Dacron-only cloth---and it's the responsibility of sailmakers to deal with the problem. In exotic materials the solution is to radiate the panels out from each of the load corners of the sail. This is simple with CAD-CAM, and competent because laminates are much more stable than woven- only cloth. But, woven-only Dacron is the odds-on favorite for cruising sails: lower cost and the incredible durability of 15-20 years in many sails. So, If the material is so durable, why not execute the design and construction to hold the shape in place as well? Bravo, the miter cut---especially for roller reefing genoas---which is practically every genoa built today. Other sailmakers simply make cross-cut genoas and shrug their shoulders about the consequences. We take the extra time and skill (and charge a 10% premium) necessary to build a truly long-lasting, stay-flat when reefed, genoa---for serious cruising performance. Some sailmakers offer radial cut genoas from woven-only cloth; but we do not, because the breakdown is rapid and the resulting washboard looking sail is something we would not want our name on. Full Batten Mainsails account for 80% of the mainsails we build today. Full battens permit maximized area (roach) and the battens do for mainsails what the miter does for genoas--maintain the shape. 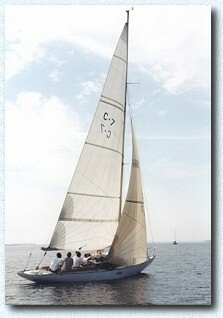 Many racer prefer just the top two batten full, the lower two nearer to normal---for slightly more control over the shape of the bottom of the sail. For most sailors and cruisers, all full battens make a faster, longer lasting and easier to set sail (our own boats, and America's Cup boats, too, are rigged with all full battens). All our full batten mainsails include Battslide, Rutgerson, or other devices to tension and transition the load (batten to mast) as standard equipment. We also make available the inclusion of Strong or Harken mast track systems at a package price. All mainsails come standard with shelf foot, tell tails, etc. Asymmetrical Cruising Spinnakers have been discovered by--and refined for--the racing fraternity and have come a long way since the early versions we started producing in the 1970's. We developed and marketed the first cruising chute and sock combination for truly short handed use. We still use the same concept for short handed sailing, but now coupled with our new TRUE Asymmetrical spinnaker. 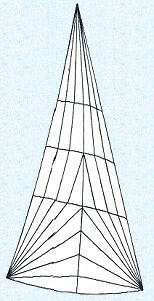 This sail can only be produced using sophisticated computer programs--as each of the more than 30 panels is distinctly different in shape and length. 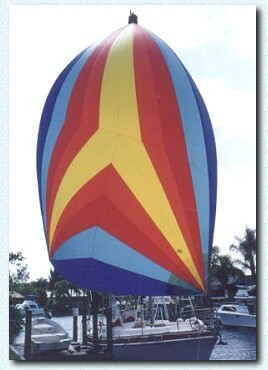 This sail is a far cry from the cruising chutes sold by most sailmakers-- usually a spherical head with a fairly flat lower section--which is really symmetrical except for one corner (the clew) lifted higher. Our Tri-Radial, true asymmetrical is the fastest headsail you can put on your boat for very tight reaching to wind far aft of the beam. This sail is designed with each of its 30-plus panels individually shaped for its greatest depth forward, like a very full genoa, with its leading and trailing edges projected outward, instead of inverted. As a draft-forward sail, it will practically go to weather, but when on a near run, its projected luff swings out to the clear-air side of the mainsail for excellent performance without a pole. We usually supply this sail with ATN Sleeve--the absolute best sock made (and we know, because we made the first one in the 1970's). Of course, we also make very fine, fast, symmetrical spinnakers for racing. Most of Our Radial sails for cruising and club racing are constructed of "cloth" using one to two mils of Mylar/Dacron sandwich or woven warp-oriented Dacron/Pentex and Dacron/Kevlar. With few exceptions, this is the most expensive sail material to use, but delivers the highest performance potential. 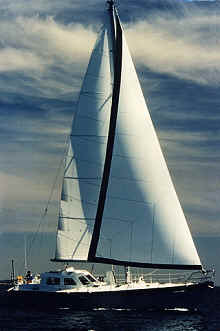 It is also 50 to 100% more expensive than woven Dacron and contributes to the higher price of these sails. Such sails lack the long-term durability of woven standard Dacron and are for sailors who don't mind replacing them more often. Built Like A Mack Sail . . .
All sails 5.62 oz. and up are triple stitched on the seams with V92 dark blue thread---over 8.62 oz., V138 dark blue two rows of wide multi-stitch. Spinnakers and radial sails are multi-stitched. Leech tablings on all cruising sails are two-plied with an extra thickness of wider Dacron tape under the tabling and leech line---it is then triple stitched. This is valuable insurance against leech fatigue and will give your sail extra years of service. Out stitch count per inch, per row, is nearly double that of most other sailmakers. Heavy duty leech lines are standard with all sails except storm sails and spinnakers. Leech lines are always centered in the tabling with stitching on either side to prevent the very aft edge of the sail from "cracking" ---a frequent problem with other sailmakers' sails. Genuine ClamCleats, are used to hold leech line adjustments at all reef and clews. All batten pockets consist of four thicknesses, plus the extra "slab" to which it is sewn with double stitching. There is an internal wrap of heavy elastic or webbing in the pocket end. Most full batten pockets are made up of 12 oz. Dacron for extra chafe protection against the shrouds. All full batten sails are fitted with hardware at the forward end to tension the batten and provide a universal joint with the mast slide. All bolt ropes are New England Spun Dacron which is the finest for the purpose. Since these lines are hidden in the sail, inferior rope is often used by other sailmakers. When boltropes shrink (an inevitable feature of poor synthetics) the sail is rendered prematurely shapeless. The higher the quality of material, the longer lasting and performing is the sail---always our goal. As stated in all our literature, we use only the top of the line fabrics in ALL our sails. Few other sailmakers can make that claim. All corner rings and reef cringles are hydraulically pressed in stainless steel assemblies. All cruising mainsail headboards are heavy aluminum anodized installed with 3/16" aircraft rivets. The shackle hole is lined with stainless steel and the adjacent boltrope is leather bound. We seldom back up our corner and reefing rings with external webbing, preferring to us extra thicknesses of re-enforcing patch material in the corners, so that after-thought measures are unnecessary. Makes a nicer looking sail, too, which is one of our hallmarks. Mainsail slides are all hand sewn on with heavy webbing for long life and kindness to the sail. Sails are all provided with tell tails and a Dacron bag. The dark stitching on our seams makes draft stripes not a necessity, but we will install them as an extra. Class insignia and numbers are also extras. Mainsail shelf foot is standard with our mainsails, and no extra charge for Cunningham or jackline, if requested.